Storytel is always full of surprises, whether it’s beating Amazon’s Audible to India, teaming up with telcos in Poland, or preparing to launch in Italy. 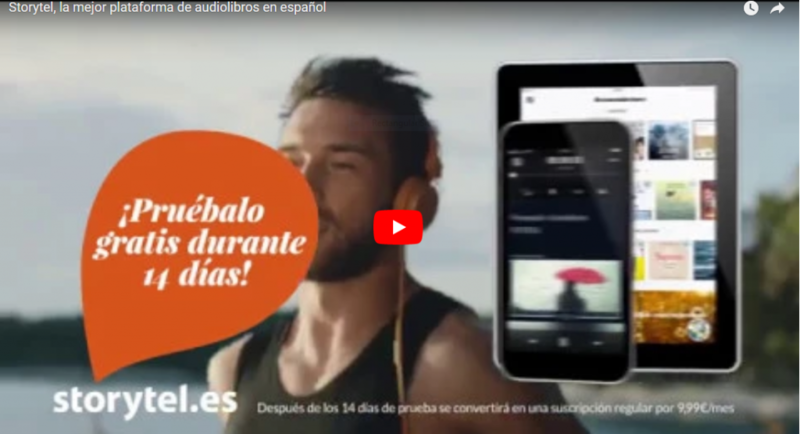 Last year Storytel launched in Spain, and to start the new year the company is running a series of adverts on Spanish TV to draw attention to its service. You can view a sample video on the Storytel Spain blog, where Storytel Spain’s team note that there has been no major book-related TV promotions for over five years in Spain. the visibility of a mobile app like ours is one of the keys to its success (and so) throughout 2018…we will launch several more advertising campaigns (having been) extremely satisfied with the results obtained during the first weeks of the first spot , both in terms of the brand’s notoriety, traffic to our website, as to the number of subscribers. listening to an audiobook can be combined with public transport trips while going to or returning from work, playing sports or waiting for a flight to leave. That is why we trust that Storytel will come to be considered the definitive solution for many people of any age who wish to recover the habit of reading. There is a compelling reason: many of us like to be told stories. Do you? Storytel is one of the most exciting of the Next Generation publisher-distributors, and who knows where it will go after this. Currently Storytel is advertising for a position as head of a new publishing imprint, Storytel Brief. The stress on having excellent English skills and the ability to handle global rights deals suggests Storytel may be looking at the Anglophone markets next. Storytel is definitely one to watch. ← Previous Previous post: Indian local languages shine as the New Delhi World Book Fair closes today.